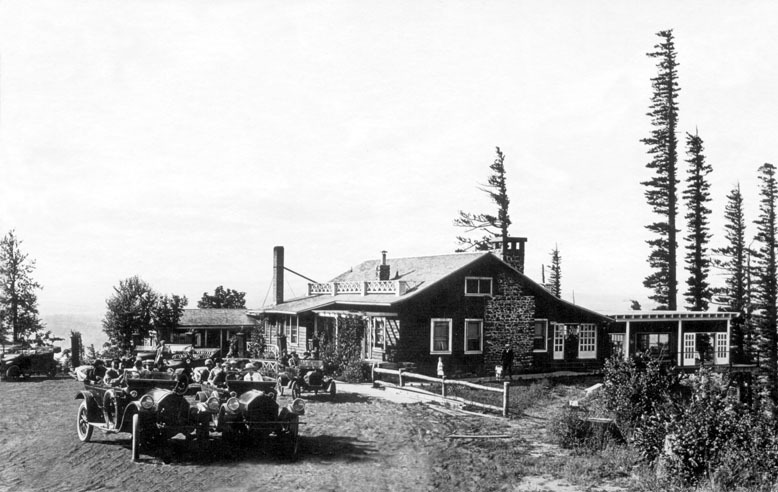 This photo of the Chanticleer Inn was taken by artist Charley Wesley Post, who had a portable studio set up at Chanticleer Point. It must have been taken in 1912 or 1913, as the addition built in 1914 is not there. Photo courtesy of Wesley Post (grandson). 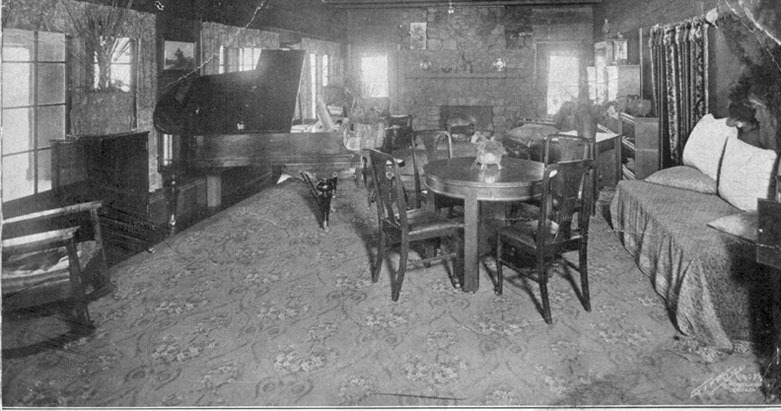 A view of the interior of the Chanticleer Inn, courtesy of Elizabeth (Morgan) Tanner. Portland Women's Forum State Scenic Viewpoint was originally named Chanticleer Point by Mr. & Mrs. A. R. Morgan who purchased the property in 1912 and built an inn on the point with one of the most magnificent views in the world. They called their popular inn "Chanticleer" after the rooster in the story, "Reynard the Fox." The area took on the name of the inn and is still known by some as Chanticleer Point. Early train travelers could take a shuttle and brave a winding road from the base of the cliff to the inn. Portions of that road still exist. The upper end of it can be accessed only by hikers from the western side of the parking lot. Several vistas are available for those taking the time to walk the existing portion of the road which is passable for eight tenths of a mile from the park. Chanticleer Inn burned and the site was purchased by the Portland Women's Forum and donated to Oregon Parks and Recreation Department. The Portland Women's Forum has worked to preserve the Columbia River Gorge for many years and is still an active group, making periodic donations to improve this park and other parks. There are two interpretive signs at this location: one describes this view and the vision of Sam Hill and Samuel Lancaster to create the Historic Columbia River Highway; the other describes the ice age floods that created this landscape. A memorial to Sam Hill is located on a large rock adjacent to the HCRH. There are four bronze plaques on this memorial. The Portland Women’s Forum was organized in 1946 for the dissemination of information concerning civic, state, national and international affairs. In 1950, after a Sunday drive up the Columbia River Highway, Gertrude Glutsch Jensen came to a Portland Women’s Forum meeting and told us that the loggers and mills were despoiling the “Great Gorge of the Mighty Columbia River”, as she called it. She was heartsick over what she had seen. She felt that the State of Oregon or the federal government could help in exchanging timber land in the Gorge for timber elsewhere. The Portland Women’s Forum established the Columbia River Gorge as it’s principal and permanent project. We wrote letters and went to meetings with the Oregon State Legislature asking for their help. Gertrude was the powerhouse behind all this. She even went back to Washington DC at her own expense to get help from Congress. In 1953, the Oregon Legislature created a three member Columbia River Gorge Commission with Gertrude Glutsch Jensen as chairman. She served in this capacity for sixteen years. Thousands of acres of land were acquired by public agencies through donations to the state, and land exchanges by the Bureau of Land Management, Mt. Hood National Forest and Hood River County. In 1956 the Portland Women’s Forum purchased 3.7 acres at Chanticleer Point -- one of the world’s famous viewpoints -- from Julius L. Meier, Jr. In order to pay for it we held teas, fashion shows, doll shows, Blue Room shows and sold life memberships guaranteeing that all those who bought life memberships in the Forum before a certain date would have their names on the memorial marker at the Portland Women’s Forum State Park in perpetuity. In 1963 the property was turned over to the State of Oregon “reserving to the Portland Women’s Forum the right to erect and maintain a memorial on the property”. PWF installed a drinking fountain at the park in memory of Gertrude Glutsch Jensen. In 1991, when the Historic Columbia River Highway was celebrating it’s Diamond Jubilee, the Portland Women’s Forum furnished the brass cover to a time capsule planted at the Columbia Gorge Hotel to be opened in 100 years. When the Columbia Gorge Interpretive Center opened in Stevenson, Washington, in 1994, the PWF donated three hand-crafted fir benches in memory of Gertrude Glutsch Jensen to be placed in the lobby. In 1998 we paid Caswell Galleries to repair, clean and polish the monuments and markers at the park including the Sam Lancaster Memorial marker at the entrance. Since 1950 to the present, the preservation and beautification of the Columbia River Gorge remains the principle and permanent project of PWF. The Forum is non-political, non-partisan and non-profit.